The venue: A food stall called Yang Wang Baojiaobu (仰望包脚步; Yang Wang means "to look up") in the Raffles City food court. 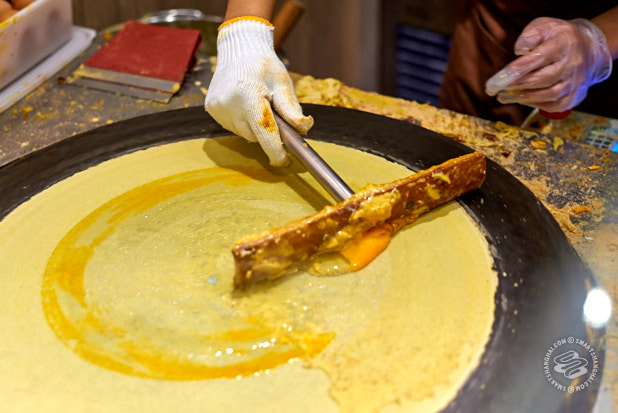 The item: Baojiaobu (包脚布) -- the Shanghainese version of that popular breakfast pancake, jianbing. The wait: Anywhere between two and five hours. We rolled on this food stall at 12.45pm. And... yes there was definitely going to be a wait for this baojiaobu. We asked an ayi who'd been waiting since 11am for her thoughts on the situation. Her answer was clear and simple: "I'm buying the hype!" "Baojiaobu" (包脚布) is quite a horrendous name for a street food; its direct translation is "wrap feet cloth". 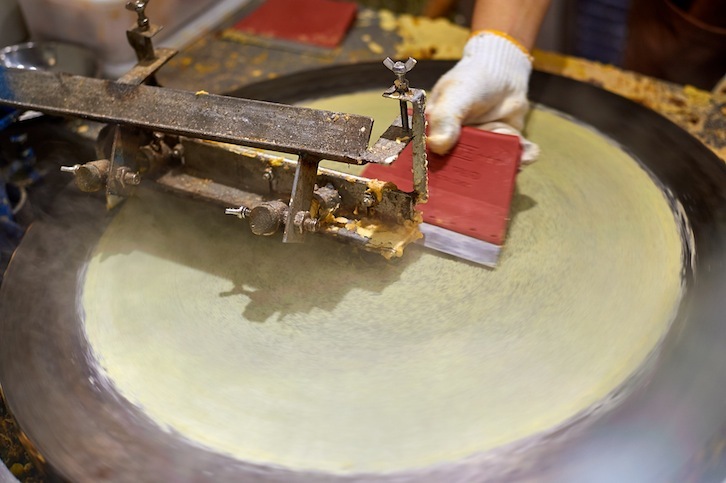 Similar to Shandong's ubiquitous jianbing, this Shanghainese traditional breakfast wrap is different in one key aspect: its bing is soft and moist, as it's made with wheat flour instead of a coarse grains flour mixture. Baojiaobu wraps youtiao instead of crispy fried cracker. It's also way less popular. So, here we are in Raffles City, waiting in line for this disappearing staple of my youth. 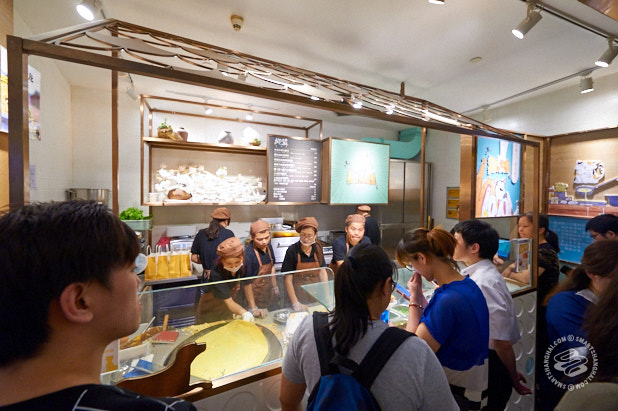 Going viral last month, Yang Wang Baojiaobu labels itself a healthier, trendier street food brand, and offers a variant much closer to jianbing than to the classic breakfast item my generation of Shanghainese people grew up with. It also offers a great location, outrageous pricing, and also a bit of that Old Shanghainese nostalgia mixed with a modern, modern, modern look that people really seem to enjoy these days. It's real popular. People on WeChat are claiming they've waited five hours for this -- they've even printed off these posts and stuck them on their wall, like it's a selling point. You can only buy two at a time. The cheapest option here is 12rmb -- that's about three times as much as the one you can get on the street. Six types of fillings are available, such as fried chicken chop, tuna, avocado & potato mash, ham & cheese, crayfish, and a "magic dragon" baojiaobu which contains seven eggs. Yang Wang claims to use "healthy coarse grains flour mixture" and Lan Huang egg -- a Japanese-imported egg you can eat raw. The crayfish one is priced at 38rmb and is possibly the most expensive jianbing-type item in Shanghai. When we went there this Tuesday at around 12.45 pm, the line wasn't long, but we were told to wait for at least 30 minutes to place an order. The couple beside us had placed their orders at around 10.30am. It takes the staff roughly five minutes to prepare the food. 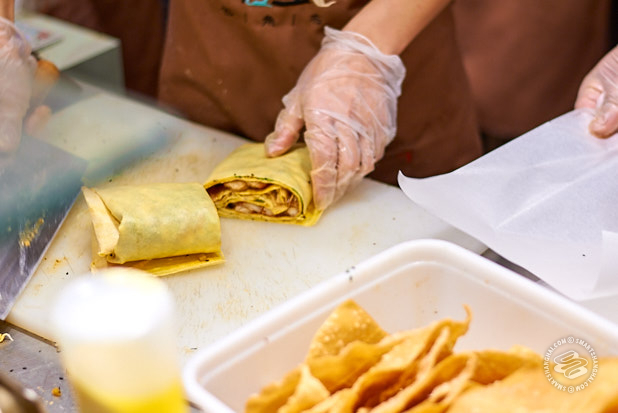 Carefully putting the finished delicacy into a paper wrap and then a paper bag takes another minute and a half. It feels like forever. It feels like an eternity. So, only one of their two pans works. The other is broken and has been for some time. At least three of their seven staff members were just idling by and waiting with the rest of us, enduring the hot steam and hopelessness alongside the customers. Waiting for Baojiaobu; waiting for Godot. So that's why. They're operating at 50% efficiency, even when 100% is not efficient. I'm not waiting anymore for this. It's because one of their pans is broken. And they don't have enough of them in the first place. Why am I doing this column again? After 45 minutes of sheer frustration waiting for a 38rmb jianbing we walked away without looking back. In case you're curious about how it tastes, we have yet to see a review on Dianping that says it's worth the wait.